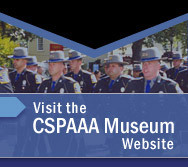 The officers and directors of the Connecticut State Police Academy Alumni Association make every effort to provide fellow members, alumni and the general public informed about the CSPAAA and its events and news. To contact a representative of the CSPAAA regarding membership, merchandise, upcoming events or general information, utilize our online contact form or receive custom directions to visit us at our store. Contact the CSPAAA via the Internet and we will promptly respond to your message.